The Vigueirat Marshes belong to the Academie du Littoral and stretch over 120 hectars. 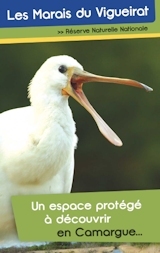 The Vigueirat Marshes belong to the Academie du Littoral and stretch over 1200 hectares of wild and protected nature. They constitute a major site in Europe for the protection of water birds. 292 species of birds, more than 60% of the French bird species, have been sighted on this estate. The site is of international and European importance for 13 species, with 35,000 ducks in winter (1/4 of the Camargue's wintering ducks). A total of 92 species reproduce onsite, including the nine European species of heron, the red-crested pochard (10% of the population in France), one of the only natural populations of the greylag goose, and an important colony of European Bee-eaters. The Vigueirat Marshes are also known for their great floral diversity: 862 indexed species, including 5 nationally protected species, 19 regionally protected species, 105 rare and endangered species in the Provence-Alpes-Côte d'Azur region. Open from 1 February to 15 December, the site offers unguided or guided visits on foot, in horse-drawn carts, twilight tours and a variety of activities in July and August. A discovery of landscapes and nature in the Camargue. These visits take you in different parts of the site to the discovery of livestock and wildlife in the Camargue. Closure in November 21st, 2017 > in February 1st, 2018. - The “Etourneau” trails: the “Cabins trail” and the “Palunette trail” Free access and open all year from sunrise to sunset, these trails allow not only kids but grown-ups and nature specialists to discover the biodiversity riches that can be encountered during the stroll.